Hand painted by a Canadian artist, these beautiful ceramic plates can be illustrated with custom images and various Canadian landscapes. Capture the essence of everything West Coast. Wild and wonderful and worth tasting. 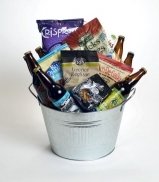 For the beer lover, our Strange Brew Beer Basket is filled with seven 650 ml Rockets from local brewers throughout the Province of British Columbia. My son was away with his grandparents in the Okanagan for two weeks this summer: camping, fishing, sailing, cliff-diving and even building a plane. When he got home, he told my husband and me that his new slogan is “Live Full, Regret Nothing”. What a great inspiration for us as we transition into the Fall/Winter season! With the days getting shorter and darker, remember to get outside and take full advantage of the everyday beauty around you. To us, Living Full means enjoying the outdoors regardless of the weather. Enjoy the mountains, breathe the fresh air into your lungs and get above the clouds. While my son was Living Full, we were working harder than ever at Green & Green and are now proud to offer Lions Gate Gifts for all your convention, meeting, conference and special event gifts. We urge you to visit our new website, Lions Gate Gifts, to peruse our wide selection of event-specific and customizable gift ideas guaranteed to add that special finishing touch to your upcoming conference or corporate event. Additionally, check out our promotional products site. This link and more can be found at Green & Green. At Green & Green we take the philosophy of buying local one step further. We encourage buying Local And More – by recognizing our place not only among our local community here at home but also within the global community. This means never sacrificing our shared values of thoughtfulness, kindness and quality. Find Local And More at Green & Green. This entry was posted in Exciting News, Gift Muse and tagged Fall, gifts, Motto, new products, Newsletter, vancouver convention gifts, vancouver gift baskets, Winter by Mindy. Bookmark the permalink.